We are introducing you our new theme with the highly professional design. Translang is an ideal WordPress option for translation agencies, as well as freelance translators. The theme is supplied with a handy order form to request translation and a get-a-quote form to request pricing. 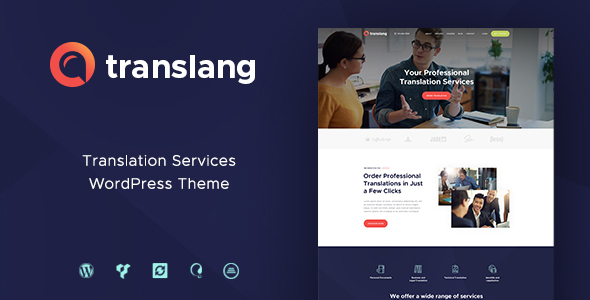 If you are looking to build a website of language courses, language centers or tutoring service, Translang will be an easy fit, too, because the theme is integrated with custom post type â€˜Classesâ€™ that will let you display language classes/courses on your website. The elegant design is compatible with the latest version of Visual Composer which makes it super easy to create your own page layouts. Besides that, the is compatible with such premium plugins, as Essential Grid, Revolution Slider, etc.